In the world of call centers, telecoms, telephony and calling solutions you often hear about CTI. 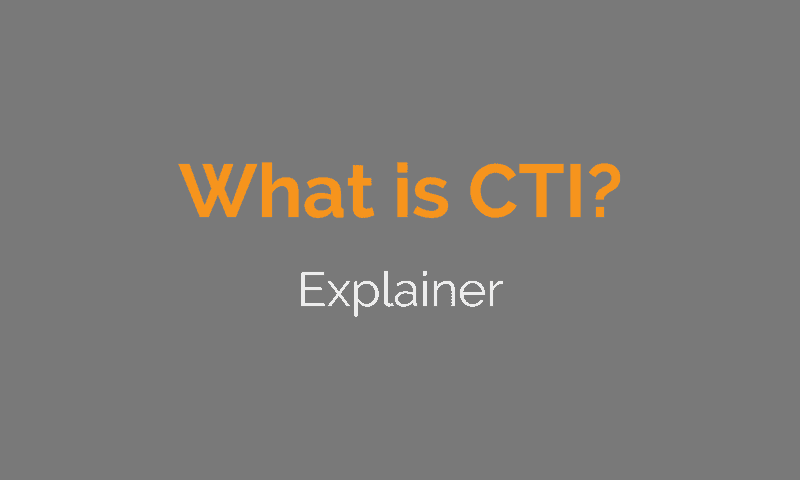 What does CTI stand for? And how does it relate to “screen pop”. First, CTI stands for Computer Telephony Integration or Computer Telephone Integration. The term is a bit misleading actually, and a little dated. But if you have anything to do with customer service or sales on the phone, then it is worth understanding what CTI is all about. Especially useful is to understand the modern approaches available to achieve the same aim. In the “old days”, we are talking about as recently as the 1990s now, it was quite complex and costly to have something that happens on a call influence another system or the other around. Any technology or product that did achieve this in any way was often discussed in terms of Computer Telephone Integration or CTI. When an employee accepts a call on their phone, they should simultaneously receive data for that call on their computer. This was very often called a “screen pop” by call center professionals and vendors of call center infrastructure and telephone systems. So the requirement from the business customer was to “pop” info on to the screen of the employee for the call just received. The second common requirement was to allow an employee to accept or start a phone call directly from their computer. The most common use cases here are to accept or reject calls presented to them within an application on their computer and to click on a phone number of a contact in a computer application in order to start the call – the second is often referred to as “click-to-call“. The third type of business requirement is an extension of the second to allow employees all kinds of additional control and interaction capabilities with their calls. For example, allow the starting and stopping of call recording, allow the addition of data to the call record during the call, allow the selection of people to transfer the call to, allow the merging of calls to create on the fly conference calls. For any user of skype or whatsapp or facetime or any number of other services that bring phone like functions into computer applications (and phone, tablet and other computer-like devices), the above functionality is readily understood without ever having to think about CTI. But in the business context, the requirement is usually more detailed than what a private individual expects. Generally what is expected is that a useful business system, a CRM, a help or support ticketing desk or some other core system of record should be integrated to allow employees any of the above features. In this situation, CTI or Computer Telephony Integration is still used to refer to the overall functionality. For example, many CRMs call their integration capability for this purpose their “CTI framework” or something similar. How is CTI done in modern systems? Simple modern telephone systems provide some of the features above, mainly number 1 and 2 by creating simple pre-built versions of “screen pop”, accept and reject calls and “click-to-call”. You can learn more about examples of all these integrated processes here. The state of the art in allowing for more complex integrated processes is currently provided by platforms that expose all of the telephone events and allow these to then impact any other modern integrated system. Today, when looking at how to create integrated phone services together with all other communications challenges, the best approach for a business of any size, is to ensure that they can quickly create, change and deploy almost any conceivable integrated process. In other words, ensure that there is no barrier to doing CTI at all.